We, human beings, have been blessed with the best of nature. After vowing to use products that are natural, handmade and pure, I have noticed a remarkable change in my skin, hair. And very soon, I will be doing a post where I will be sharing my journey of going green with my skincare, hair care with tips on how to make informed choices. Meanwhile, let's talk about Junaili. Junaili is an Indian brand based in Rautakhet, Nainital, in the serene Kumaon Hills. When I made my purchase with them, they had just two products - cold pressed Apricot Kernal Oil and Apricot Body Scrub but now they have introduced Apricot Face Oil too in their products range. One of the few interesting things about their products is that they are made in small batches to ensure their quality and their labels are first hand-sketched, photographed and then refined on Photoshop, whoa! I came across their brand through Instagram and decided to give them a shot. 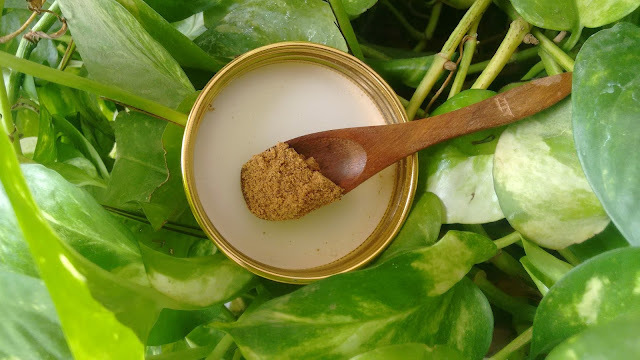 I bought only one product which was their popular Apricot Body Scrub and after using it for more than three months I am sharing my experience with our readers. At Junaili, we cold-press our own Apricot Oil and Scrub at 7000 ft in the Kumaon Himalayas to exacting standards. 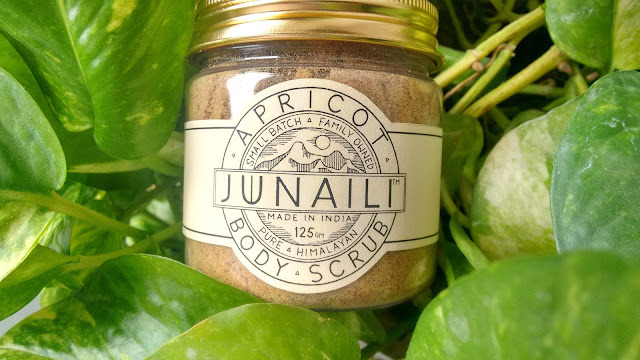 Junaili Apricot Scrub smells like dried apricots and as soon as I took the first whiff, I knew I was in love! The smell is on the bitter side but it smells so much like winters, mmm. Free of additives, harsh chemicals, preservatives, this scrub is pure love as it contains just one ingredient! The scrub comes in a simple looking plastic with a dull gold screw tight lid and an aluminium foil sealed on top to ensure freshness. The label on the jar bears all the important details and jar itself looks very classy and has a vintage feel to it due to the design on the label. 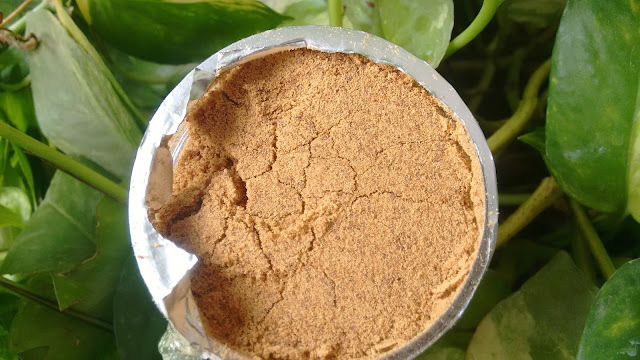 The scrub has a finely milled consistency and a coarse texture. To use, I scoop out the desired product and rub it directly on the damp skin (but you can make a thick paste using rose water/milk). The scrub doesn't feel harsh and takes off dead skin cells and dirt effectively. My skin feels soft, supple and smooth after every use. I use the scrub 1-2 times a week owing to my busy schedule though I would love to use the scrub about 3 times/week. This scrub has definitely made my bathing experience a good one! Apricots, popularly known as khubaani in Hindi/Urdu has always been a favourite fruit of mine and using it in form of scrub was the cherry on the cake! Apricots are known to stimulate the growth of news cells and escalate healing. With regular use, you may expect apricots to impart a nice glow and make the skin smooth and healthy. It smells like winters! That smell of dried apricots, yummy. The scrub doesn't dehydrate the skin. The scrub is not harsh on the skin. Makes the skin soft, smooth and supple. The scrub is reasonably priced. The scrub is priced at INR 250 for 125 gm and I find it economical for the quantity. I have been using it for more than three months and I still have one-third of the product left. The product can be bought from HERE. Yes. The scrub does it's job really well without causing any damage to the skin! It's perfect for the dry and cold winter season. So, do not think and indulge in the goodness of hills, right away. Tell us which body scrub you are digging at the moment.